Colossus Bets is a footballpools website. The Football Pools is basically correct score betting or correct result betting that offers life changing prizes for small entry fees. The Colossus itself is worth a staggering £10,000,000. It costs just £2 to enter, to win you have to select 7 correct results / scores in the pool selection for a given week. Example of the £10mil Pool Game. 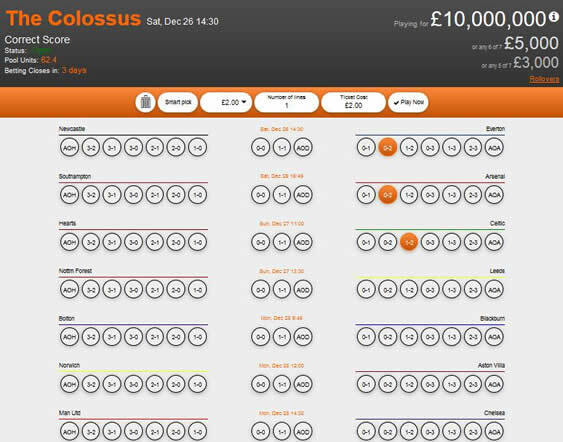 The Colossusbets game is available to play in most countries, those countries excluded from joining are Spain, Belgium, France, Hong Kong, Turkey, USA and Israel if your from anywhere else you can play. The collosus bets website is available in English, Spanish, Portuguese and Chinese. Pick 6 – Put simply pick six correct scores / results. The prize for this is a massive £500,000 and as a great bonus to our readers Colossusbets have offered a free game, no catches, sign up and play for free. Pick 3 – This is a pool with a guaranteed £2000 again predict 3 correct scores / results. Had 8 – This has a guaranteed prize pool of £2000, this game is what your probably used to doing the football pools, you pick 8 correct outcomes ie Home Win, Away Win or Draw. Colossus Bets is really a unique football betting site, its just different than the others and for small amounts of money you really can win life changing amounts. One of my favorite features of the colussus bets site is the cashout offers, you could be on your way to winning and at half time you might be offered a fraction of the pool. If it ever happens to you really think strongly about it. I have read some horror stories including one person turning down £360,000 with one result to go and it did not go there way. Ouch! Now you know what the Colossus is its time to try it out. Like I have said you can play it for free, what we will do is post the weekly games like we do with Scoop 6 and Super 6. Cashed out at half time and won huge!